The Governor of Wisconsin is the highest executive authority in the government of the U.S. state of Wisconsin. The position was first filled by Nelson Dewey on June 7, 1848, the year Wisconsin became a state. Prior to statehood, there were four Governors of Wisconsin Territory. 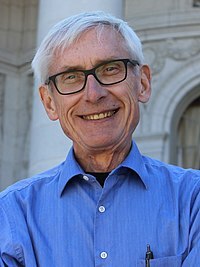 The current governor is Tony Evers, a Democrat who took office on January 7, 2019. The governor of Wisconsin is responsible for ensuring that the laws of Wisconsin are carried out, and is also required to "communicate to the legislature, at every session, the condition of the state, and recommend such matters to them for their consideration as he may deem expedient." Any bill passed by the Wisconsin State Legislature must be presented to the governor, who either signs it into law, or vetoes it. In the event of a veto, the bill is returned the legislature, who may then vote to override the veto. In 1930, the Wisconsin Constitution was amended to give the governor line-item veto power, which allows portions of appropriations bills to be struck out without rejecting the entire bill. The partial veto may still be overridden by the legislature. In 1990 a further amendment specified that the line-item veto does not give the governor power to veto individual letters of appropriations bills, thereby forming new words. The governor is the commander-in-chief of the militia of the state. If it is deemed necessary, the governor may also convene extraordinary sessions of the state legislature; and may convene them anywhere in the state, if Madison, the state capital, is deemed unfit for the purpose due to invasion or contagious disease. The governor has the power to pardon or commute sentences or grant reprieves thereto, except in cases of treason or impeachment; it is required that notifications of these be submitted to the Wisconsin State Legislature each year, along with the reason for them. In cases of treason, the governor may suspend the carrying out of the sentence until the next session of the legislature, who then vote to grant a pardon, commutation or reprieve, or to carry out the sentence. The governor of Wisconsin is elected in a direct election—the candidate with the most votes becomes governor. In the event that two candidates receive an equal number of votes, which is higher than that received by any other candidate, the members of the state legislature vote between the two at their next session. In order to be eligible for the office of governor of Wisconsin, a candidate must be a citizen of the United States and a qualified voter in the state of Wisconsin. Under the original Wisconsin Constitution, governors were elected for a term of two years; in 1967, the constitution was amended to increase the term of office to four years, beginning with the governor elected in the 1970 election. There is no limit to the number of terms a governor may hold. The governor may be removed from office through an impeachment trial or through a recall election. An impeachment trial is carried out by the Wisconsin State Assembly, if a majority of its members agree to the impeachment. A governor may also choose to resign from office. Four governors have resigned for various reasons, and none have been removed from office through impeachment, although Arthur MacArthur, Sr., who, as lieutenant governor, became acting governor upon the resignation of William Barstow in 1856, was removed after the Wisconsin Supreme Court ruled that Barstow's opponent in the previous election, Coles Bashford, was the election's legitimate winner. In 2012, Scott Walker became the only governor in Wisconsin history to face a recall election. He retained his seat, defeating Milwaukee mayor Tom Barrett by seven percentage points, a margin one point greater than that of the 2010 election, becoming the first governor in American history to survive a recall attempt. Originally, the state constitution specified that the Governor and Lieutenant Governor of Wisconsin were voted upon separately, but in 1967, the constitution was amended to state that they were elected together. Prior to this amendment, there were nine incidents in which the elected governor and lieutenant governor were not of the same political party. Originally, the state constitution only said that in the event of the impeachment, removal from office, death, resignation or absence of the governor, or in the event of the governor being unfit to serve due to illness, "the powers and duties of the office shall devolve upon the lieutenant governor" for the remainder of the term or until the governor is able to return to office. In 1979, the constitution was amended to specify that in the event of the governor's death, resignation or removal from office, the lieutenant governor becomes governor for the remainder of the term, but in the event of impeachment, incapacitation or absence, the lieutenant governor merely becomes "acting governor" until the governor can return to his duties. The original constitution also specified that in any of the aforementioned events the Secretary of State would become governor if the lieutenant governorship was vacant, but after 1979 this provision, too, was amended to distinguish between "governor" and "acting governor." There have been 44 Governors of Wisconsin and 45 individual governorships. One governor, Philip La Follette, served non-consecutive terms. Four parties have had their candidates elected governor: the Democratic, the Whig, the Republican and the Progressive. The longest-serving governor was Tommy Thompson, from January 5, 1987 until February 1, 2001, a total of 14 years and 28 days; the shortest-serving was Arthur MacArthur, Sr., from March 21, 1856 until March 25 of the same year; a total of 5 days. Four governors have resigned: William Barstow due to fraud allegations, Robert La Follette, Sr. to take his seat in the United States Senate, Patrick Joseph Lucey to become Ambassador to Mexico, and Tommy Thompson to become United States Secretary of Health and Human Services. Additionally two governors—Louis Harvey and Walter Samuel Goodland—died while in office, and Orland Loomis, who was elected governor, died before taking office. ^ "Wisconsin Constitution, As amended through June 30, 2005" (PDF). State of Wisconsin Blue Book 2005–2006. Wisconsin Legislative Reference Bureau. July 2005. Archived from the original (PDF) on October 25, 2007. Retrieved October 18, 2007. ^ a b c d e "Wisconsin Governors since 1848; Wisconsin Constitutional Officers: Lieutenant Governors" (PDF). State of Wisconsin Blue Book 2005–2006. Wisconsin Legislative Reference Bureau. July 2005. pp. 30–31. Archived from the original (PDF) on October 25, 2007. Retrieved October 18, 2007.